A 750 Wedge is shown. 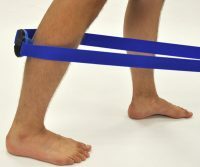 The Wedge raises the 750 to compensate for the natural curve of the thigh and angle it in, normal to the muscle. 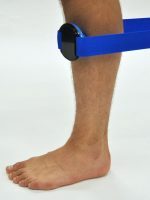 The angle and height, relative to the thigh, mean that only small movements are necessary to change the pressure experience. Side-lie to gently engage your TolaPoint with your thigh. 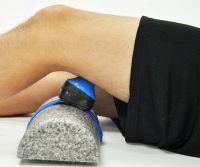 Relax your thigh and let the weight of your leg create pressure as required. For more pressure, use your opposite shoulder and hip to roll your body weight onto your Point.